Fred and I was partners for over 30 years, I miss him very much. But great friends carry on the things that was important to each other and the CPR class will cont....The Beat Goes On! Frederick "Freddy" Ray Tillis Jr., 54, was received by his Lord and Savior on Monday, March 19, 2012, after a short illness. He was preceded in death by his mother, Madolyn Tillis; grandparents, Bertha and Lester Freshour and George W. Sr. and Geneva Susan Thomas Tillis; and uncles, Robert C. Tillis and George W. Tillis Jr. Fred never met a stranger, and he could always make you laugh and he loved to share his beautiful smile. He was an inspiration to many wanting to serve with EMS. He is survived by his father, Frederick R. Tillis Sr. and wife, Hannah, of Charleston; brother, Kelly L. Tillis and sister, Deborah Adkins, both of Cross Lanes; and a host of nieces and nephews. 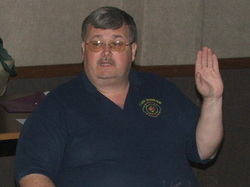 Fred was a longtime emergency medical technician, currently serving Kanawha County Emergency Ambulance Authority and Tyler Mountain Volunteer Fire Department; EMS Director for Collins P. Huntington New River Train Excursions; and CAMC BLS Instructor. He started in EMS as a volunteer in 1977 with Kanawha County Emergency Ambulance Authority through the Cross Lanes Volunteer Ambulance and Sissonville Volunteer Ambulance. He was a former employee of Duff Ambulance and Rollerena in North Charleston. Most will remember Fred for his passion for teaching CPR/First Aid classes throughout the state, and his love for EMS, his family and friends and the Collins P. Huntington Model Railroad Club. A special thank you to Kanawha County Emergency Ambulance for helping the family during our time of need. He really loved working with all of you. The family suggests memorial contributions be made to The Fred Tillis Jr. Memorial Fund, 503 Bream St., Charleston, WV 25387. Funeral service will be held at 11 a.m. Thursday, March 22, at Perrow Presbyterian Church, Cross Lanes with Chaplain Scott Nasby officiating. Burial will follow in Tyler Mountain Memory Gardens, Cross Lanes with fire and EMS honors. Friends may call from 6 to 9 p.m. Wednesday at Tyler Mountain Funeral Home, 5233 Rocky Fork Road, Cross Lanes.